Government employees must remain alert to workplace violence, particularly those employees who perform work away from government office buildings. Because of this and of the potentially volatile situations they find themselves in, police officers and social workers must always be on the lookout for potential violence. The US Occupational Safety and Health Administration defines workplace violence as "any act or threat of physical violence, harassment, intimidation, or other threatening disruptive behavior that occurs at the work site." It is not limited to employee-on-employee altercations. Workplace violence includes all forms of violence in the workplace such as a criminal robbing a convenience store at gunpoint or a belligerent drunk threatening a bartender who refuses to serve him any more alcohol. Workplace violence can be fatal. According to the US Bureau of Labor Statistics, homicides accounted for more than 11% of workplace injuries in 2010. Homicide is the biggest killer of women in the workplace. OSHA is the US government's oversight agency for workplace issues. It is part of the US Department of Labor. OHSA inspects workplaces and provides feedback to employers about what they can do to prevent workplace injuries. This includes inspecting for and providing information on workplace violence. Generally speaking, private employers and governments fall under OSHA's jurisdiction. According to OSHA, the Act does not cover the "self-employed, immediate family members of farm employers that do not employ outside employees, and workplace hazards regulated by another federal agency." OSHA recommends that employers adopt a zero-tolerance policy against workplace violence that covers employees, contractors, customers and anyone else who may come in contact with the organization. Such a policy not only protects employees from violence, but it also protects the employer if violence occurs. Employees should be trained on the organization's policy, ways to mitigate the risk of violence, on spotting violence about to occur and how to handle violent situations. 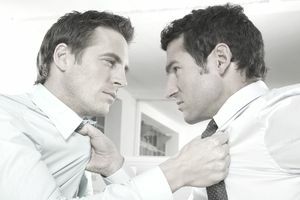 Depending on the company and the position a particular employee holds, the appropriate course of action may differ in handling violent situations. For example, a retail clerk and a police officer would follow very different protocols when faced with a violent situation in the course of performing their job duties. While retail employee would be expected to avoid violence at all cost, the police officer would likely confront a violent situation. The American idiom "going postal" was coined in reference to a string of incidents beginning in 1983 of United State Postal Service employees going on killing sprees at post office locations. Los Angeles police officers faced the task of quelling riots in 1992 after a jury acquitted four LAPD officers accused of beating African-American truck driver Rodney King. Terrorist attacks on government offices such as the Oklahoma City bombing in 1995, the bombing of the USS Cole in 2000 and the September 11 airline hijackings and subsequent crashes in 2001 can all be classified as workplace violence. The September 11 attacks constituted workplace violence for airline employees, business travelers, Pentagon staff and World Trade Center employees. How Much Time off Do Government Employees Get? Who Is Above the City Mayor in Local Government? How About a Career at the Smithsonian?